Anxiety has become a common problem in our planet nowadays, that’s why I am bringing a few simple deep breathing exercises for anxiety treatment in this post using which you can successfully get rid of your anxiety issues. Unfortunately, people rely more on therapists and pills to treat their emotional problem which in some cases is indeed essential but, what most people fail to understand is that the simple practice of conscious breathing can prove out to be an amazing tool for achieving the peace of mind. It is not the practice but the lack of faith which results into the failure of a person to leverage these techniques. How Is Breath Related to Human Emotions? Before jumping into the methods let us talk about how and why this stuff works. It is known and found in anxiety patients that their breathing becomes shallow when they are troubled by the emotional imbalance. The mental disturbance experienced by a person in such states is clearly reflected in his breathing patterns which he could see for himself by becoming a little more conscious of his breathing during such times. In fact the nature of our breath varies in different ways under different circumstances, sometimes it is evident enough to be discerned and sometimes it requires a lot of awareness to feel the difference. The question which arises here is can we reverse this process? Since our breath is related to our emotional states can we follow a certain breathing pattern to induce any particular emotional response?-The answer is yes!! However it takes a bit practice to achieve that as your mind has been running the show in its way for years it has a great control over you so, I urge you to be persistent with these practices before you expect results. You will get instant relief using some of these techniques but, to see permanent changes you will have to practice it for long. Mindfulness breathing is very much effective in helping anxiety patients because it works on the root cause of the problem. All emotional troubles are caused by a person’s lack of control over his mind in one way or the other, anxiety is a result of the addictive negative thoughts related to future. It starts as a common habitual worry about the future and insidiously it grows to become your second nature, at one point you are not even conscious enough to know that dreadful movies are being played inside your head and all you can sense is that you are experiencing unavoidable intense negative emotions. Conscious breathing is simple yet very powerful tool you have at your disposal to bring more peace in your life because it enables you to detach your mind from incessant negative thoughts and bring it into the present moment where you are totally free of any kind of worry. You can do this wherever you want and at anytime you prefer..
-Sit in a comfortable position, much better if you can sit in cross legged position by keeping your spin erect. -Place your attention on your breathing and observe it for a while, notice the rhythm of your natural breaths. You can stop at the point where you feel relaxed and free of disturbing thoughts. Nadi shodan pranayam is a yogic exercise where you take deep conscious breaths from alternate nostrils. 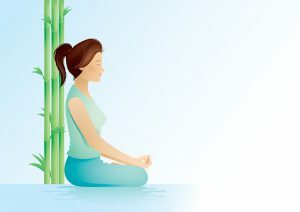 In yoga this particular technique is considered as a very powerful one for calming down the mind chatter. Again you can either choose to sit in a posture that’s convenient for you or sit in cross legged position with your back straight (which is best for this practice). -Close your right nostril by pressing it with your right thumb and inhale deeply through your left nostril. -Hold your breath for about 6-10 seconds. -Close your left nostril using your right ring finger and exhale through right nostril. -Next, reverse the process by inhaling from right nostril and exhaling from the left. Continue this way for more than 5 minutes or till you feel relaxed. -Sit in any comfortable position. -Place your one hand on your chest and the other one on your belly. -Take a deep breath in, feel your chest and belly expand while inhaling. -Exhale, feeling your chest and lungs contract back to normal. Do this for about 10 minutes and you will feel rejuvenated. In this exercise you will have to make humming sounds as brahmari means humming bee in Sanskrit so, make sure to practice this in privacy. This single practice is something I find so beneficial to tame my mind when it makes a lot of noise and I hope that it will do the same for you too. -Close your ears with your thumbs. -Place your index finger on your eyes, middle and ring finger on your nose and little finger on your mouth. -Now inhale deeply and then release the breath gradually by making a humming sound. -Feel the vibrations in different parts of your face through the fingers placed on them. -Stop when you feel relaxed. One of the best programs I ever found to deal with anxiety and low self-esteem was uncompromised life hypnotherapy course. This is a personal development blog and I am just providing you a few solutions for these mental afflictions based on what I have learned from various sources if you find yourself seriously affected by these states then I would advise you to seek a professional help.